Machen Sie einen Tagesausflug nach Chiang Rai und ins Goldene Dreieck, um zu sehen, wo die Grenzen von Thailand, Burma und Laos zusammenlaufen. Mit einem sachkundigen Führer fahren Sie durch die malerische Landschaft, besuchen lokale Bergstammdörfer und tauchen in die heißen Quellen von Mae Ka Chan ein. Bewundern Sie den Weißen Tempel (Wat Rong Khun) und genießen Sie den Blick über den Mekong, während Sie etwas über diese Region erfahren, die für ihren Opiumhandel berühmt ist. Mittagessen und Hin- und Rückfahrt mit dem Hotel ab Chiang Mai sind inbegriffen. 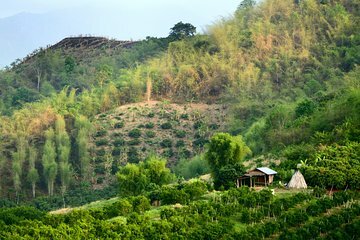 Nach der morgendlichen Abholung von Ihrem Hotel in Chiang Mai können Sie sich bei einer landschaftlich reizvollen Fahrt durch die Landschaft im klimatisierten Komfort Ihres Fahrzeugs entspannen. Auf dem Weg zum Goldenen Dreieck und Chiang Rai hören Sie zu, wie Ihr Reiseleiter die ganztägige Reiseroute ausführt und Informationen über diese ehemalige Hauptstadt des Opiums bereitstellt. Machen Sie einen Stopp in den heißen Quellen von Mae Ka Chan, wo Sie in drei natürlichen Pools Muskelkater versenken können. Lassen Sie winzige Fische tote Haut an Ihren Füßen knabbern oder kaufen Sie Wachteleier, um im kochenden Wasser zu kochen. Zurück im Fahrzeug werden Sie an die Grenze zwischen Thailand, Myanmar (Burma) und Laos gebracht. Genießen Sie von einem Aussichtspunkt auf einem Hügel einen Panoramablick über die drei Länder. Ihr Reiseführer weist Sie auf den Zusammenfluss der Flüsse Mekong und Ruak hin; Schauen Sie sich die Szene unten an oder entscheiden Sie sich für eine Bootsfahrt über den mächtigen Mekong (eigene Kosten). Weiterfahrt nach Mae Sai, dem nördlichsten Handelspunkt in der Nähe der Grenze zwischen Thailand und Myanmar, wo ein regionales Mittagessen serviert wird. In der Nähe der schönen Stadt Chiang Rai begleitet Sie Ihr Reiseleiter zum Wat Rong Khun - auch bekannt als der Weiße Tempel - ein moderner Komplex aus schimmerndem Glas und gestrichenem weißem Gips, der von einem einheimischen Künstler, der 1997 mit dem Bau begann, wieder aufgebaut wurde. Auf der Rückreise nach Chiang Mai besuchen Sie die Bergstammdörfer Akha und Yao, bevor Sie in Ihr Hotel absteigen. Die Tour ist schon recht lang und anstrengend. Zudem ist der Besuch in den Bergdörfern sehr skuril. Der Aufenthalt am Goldenen Dreieck war definitiv zu kurz. Dafür ist das Mittagessen kurz zuvor sehr gut. Our drived was amazing! Took us to hot springs on the way and Golden Triangle on our way back! I would do this tour again! First, the guide was great. I give her a lot of credit. Maggie was smart and helpful and answered all questions. We were the only ones on the tour. There was nothing that let us know there would be so much time spent driving. I'm not an expert on Thai geography, it was our first trip. We were rushed in and out of the White Temple, we were taken to a village but was actually a tourist trap with people selling the same trinkets you find everywhere. There was one house that we peeked in. We were offered entry into the long neck women village aka human zoo, for 500 baht each. We didn't do it. We then drove, 1 1/2 hours to the golden triangle for photo ops and a quick trip through the Opium Museum which is not much of anything. We could have gone on a boat ride but that would have been another 750 baht each. Since we were the only ones on the tour and since we had a 4 1/2 hour drive back to Chiang Mai we chose to get back to our hotel. Not worth this trip. In hindsight I would hire a driver or rent a car and visit the White Temple. This is a very long tour. Our tour guide was not very informative and didn't really answer our questions. The "hot springs" is in a parking lot and did not seem sanitary. The white temple and the opium museum were worthy parts of the tour. But the drive to and back from the border took 5 hours each way. I would not recommend this tour. The "Golden Triangle", the border with Laos and Myanmar is interesting, but only for about 10 minutes. Then you realize you drove 5 hours to get there. The lunch was the worst food I had on the vacation. It was especially disappointing because I am a big fan of and love Burmese food. It was an old, sad buffet populated entirely by large tour groups. Waste of a day. We were the only ones on our tour. It probably would have been improved by a better tour guide, but it would still have been a very long driving day. The trip was long, but understandably so. I thought going the distance to see the Golden Triangle and northern Thailand was worthwhile. The drive through the farmland and rice paddies was truly beautiful, but I love seeing how people live and scenery. The stop at the tribal village was interesting---again being somewhat a sociologist I was interested in seeing how people live. But I was also saddened that these women are forced to make their living in this manner and are refugees from their own countries with many family members being in refugee camps. I think this is a group that will disappear in the future and whose traditions and culture will disappear to the museums. I am glad we had the opportunity to meet them and buy some of their products. Our guide Oi was fantastic. She was so knowledgeable and entertaining. A very nice trip. Enjoyed the small group and in a very nice van. Maggie our guide was very good. A little rushed at times, but ok. Nice to see the Silver Palace, and Golden Triangle. Bring your passport so you can ride the boat over to Laos. Recommend for a nice day trip. This is a very long drive, 12 hours in all. The hot springs, if you have ever been to one, is nothing to write about. Then we stopped at the White Temple. That is a must see. Spectacular. Not a holy temple but the architecture is so beautiful. Then we had lunch and then the Golden Triangle. Very nice view to photograph but that is all. Not worth the 12 hour drive. 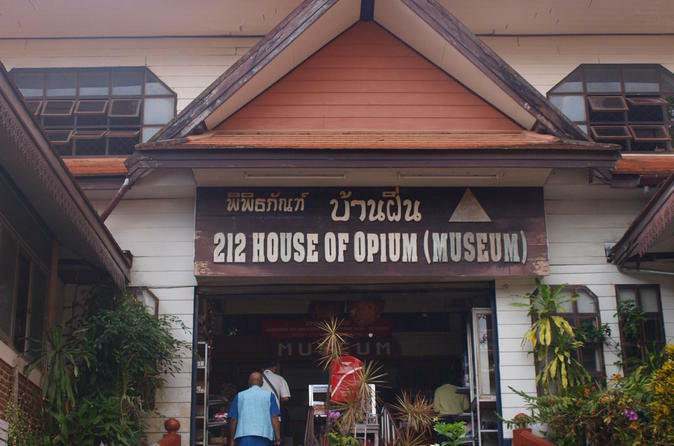 We also visited the Opium Museum. Very interesting. Then we were offered for a little more money to see the Karen tribe of the long Neck Women. That was the highlight of our trip. We found it fascinating. We were allowed to photograph the women and I was even invited to try on a mock up of a half coil around my neck. What a great picture that made. The tour is well organized. Our guide, Pong, was nice but hardly offered any information. I would think that she could have pointed out some points of interest along the way up making the trip more acceptable, even fun. I would certainly contact Viator to organize our tours on our next trip. Floating market was awesome. The only thing is the time on the boat was too short. Soooo much to see and buy. The Golden Triangle is where the 3 countries meet. Pretty cool to see. The highlight was the Karen Tribe Long Neck. Super. It really was out of Nat Geo. Bring Thai . You'll want to buy their hand woven scarves and beautiful items.Probably my favorite place on my trip to Thailand. The White Temple is gorgeous. Quite a spectacle. Almost amusement park feel to it. Gorgeous grounds.